Battery pros and cons explained. Tips for finding replacement batteries. 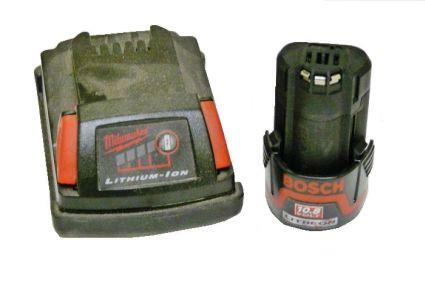 Cordless tool battery choice is almost as important as the choice of tool itself. cycle life- the overall life of the battery or how many charges it will last. self-discharge- when a battery loses its charge when not in operation. voltage- determines how much power a battery delivers at a given time. capacity- how long the battery can operate between charges. deep discharge- when a battery is allowed to completely drain through normal use. memory effect- a way that a battery's capacity is reduced through improper charging and storage. cycle life: varies; can be longer than NiCd if stored and charged correctly. Li-Ion batteries should only be charged at a speed specific to each battery, usually about 3 hours. Because the battery is what makes it possible for cordless tools to do their work, choosing the type of battery technology that the tool uses is almost as important as the choice of tool itself. For example, if the battery's capacity, charge time, or storage characteristics are mismatched to the work or user, the expensive tool it's attached to might not do the user much good. Cordless power tools are used all over, and they're becoming even more plentiful. Manufacturers release more cordless models, and more powerful models, every year. On top of that, power tool battery technology is also seeing rapid changes. This means that there are more battery options out there (and we'll probably be seeing more), and that many of those batteries are expected to do heavier work than ever before. The best thing that shoppers can do is be as informed as possible about battery designs, performance, specifications, and features to keep up with the industry. The information in this article gives cordless tool users and shoppers the head-start they need to choose the right rechargeable battery types for their cordless tools, and then get the most out of them. 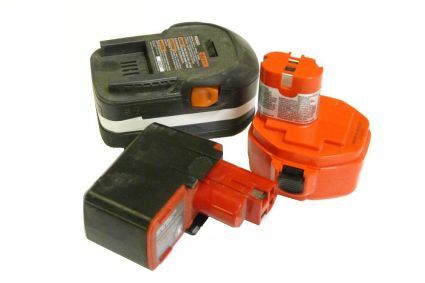 There are a few terms and characteristics about rechargeable batteries that shoppers should become familiar with before setting out to make a cordless power tool purchase. Things that affect a battery's overall life and run time are usually the determining factors when power tool battery shoppers zero in on a decision (after cost of course), so most of the characteristics explained below have some influence on how long a battery will last. The overall life of the battery, usually expressed as the number of charge cycles that it can withstand before completely losing its charge capacity or ability to transfer energy. For example, NiCd batteries tend to have a cycle life of 1,000 charges (cycles) or more. All rechargeable batteries eventually wear out, although they wear out for different reasons. Age, use, and memory effect can all contribute to the inevitable death of a power tool battery, depending on the battery type. Users often have to choose between a long cycle life and other attractive features, like run time. For example, because they can run longer between charges than other battery types, the shorter cycle life of Li-Ion batteries isn't usually a problem for users who care more about keeping their tool in operation for longer periods. All rechargeable batteries slowly lose their charge when not in use, but some batteries lose their charge much faster than others. For some users, batteries with fast self-discharge rates aren't a problem, especially if their cordless tool's see little or no storage. 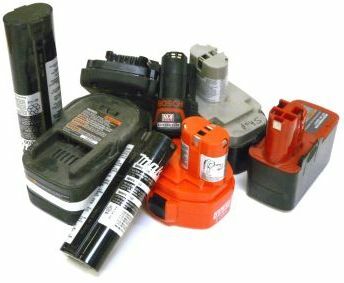 Batteries with a slower self-discharge rate become more important for tool users who plan to user their cordless tools only occasionally. Voltage determines how much power a battery can deliver at a given time. Simply, cordless tools with higher voltage are more powerful. Rechargeable power tool batteries are usually a cluster of individual cells. The combined voltage of the cells determines the battery's overall voltage; however, different types of batteries (NiCD, NiMH, Li-Ion) have different individual battery cell voltage capacities. For example, the battery for an 18v cordless drill with a lithium battery would consist of around 4 individual Li-Ion battery cells, because Li-Ion batteries can typically deliver 3.6v-4.2v per cell. Individual cell voltage for NiCd and NiMH batteries are about 1.2v and 1.4-1.6v, respectively. This is the amount of time a battery can operate its tool between charges. A battery's capacity it usually expressed as the amount of amperage hours (Ah) that it can deliver. "Ah" is different than the tool's overall amperage rating (the current at which the tool operates). Instead, Ah represents how much energy flow the battery can hold, not the level of current during operation. When shopping for cordless tools and their batteries, just remember that a higher Ah means longer battery use between charges. Deep discharge means allowing a tool battery to completely drain of energy through normal operation. Deep discharge can be a problem for some batteries, and drastically reduce a battery's cycle life and capacity. For other battery types, deep discharge is not a problem. Also , some batteries require deep discharge periodically to keep the battery healthy. This additional maintenance can be a hassle for users who do not use their cordless tools often. Memory effect happens when a battery is charged over and over again without being allowed to fully drain. The idea is that somehow the battery "remembers" how much it is being recharged, and then adopts the shorter charge range as its new charge capacity. Interestingly (and confusingly), the nickel based batteries that are susceptible to memory effect retain their capacities best when they are charged after dropping to only 70% of their capacity. However (and this is the trick), they must be allowed to deep discharge periodically so that the battery "remembers" its true capacity. Some rechargeable batteries are sensitive to "memory effect," and some are not. There are three major rechargeable battery technologies in use today for cordless power tools: nickle cadmium (NiCd), nickle metal hydride (NiMH), and lithium ion (Li-Ion). We describe these battery types below, list pros and cons, and offer an overview of characteristics and specifications for each. The oldest design of the three, NiCd batteries are still in use today because they are tough, inexpensive, and have a long cycle life. Although they are still great for some jobs, NiMH and Li-Ion outperform NiCd batteries overall. NiCd batteries are more difficult to damage from heat and impact. NiCd batteries have a longer cycle life of about 1,000 charges. They put out strong current flow. They are less easily damaged by being stored in deep discharge, although it is still not recommended. They are less expensive than other rechargeable batteries. Nickel Cadmium batteries are the heaviest of the three types. Lower capacity than other batteries. NiCds shouldn't be allowed to drop below about 70% charge between charges, or the battery lifetime can be shortened. Most NiCd batteries must be allowed to cool before being recharged. Must be allowed to deep discharge about once a month or they will suffer severely from memory effect. The cadmium in NiCd batteries is very damaging to the environment and must be disposed of correctly. A newer technology, NiMH batteries improve upon NiCd in several ways, including less toxicity to the environment. The biggest improvement with NiMH is their increased capacity, which can be two to three times longer than NiCd batteries. 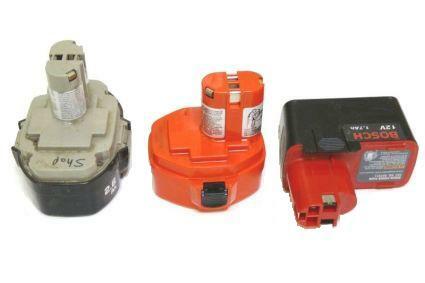 However, NiMH are also very sensitive to storing and charging conditions. NiMH batteries are a little lighter than NiCd batteries. They have a higher energy density, meaning that their capacity is greater than NiCd batteries, running 2 to 3 times longer in a single charge. They are less expensive than Li-Ion batteries. Capacity loss can be reduced drastically if charged and stored properly, making it possible to greatly increase their cycle life. They are not destructive to the environment. 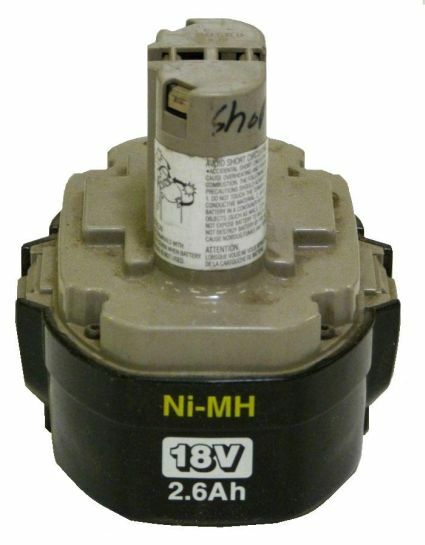 NiMH batteries are more sensitive to temperature, especially cold temperatures, and should only be stored or operated between about 33°F - 103°F. Deep discharge and lack of use will damage NiMH batteries, shortening their lifespan and limiting their storage capacity. Should usually be charged after reaching 70% capacity, but should also be allowed to deep discharge every three months to avoid memory effect. They are more expensive than NiCD batteries. cycle life: varies; can be as long as NiCd if stored and charged correctly. Lithium Ion (Li-Ion) Lithium ion batteries (Li-Ion) are the newest technology in rechargeable batteries to be introduced to cordless power tools. They are definitely the best choice of the three types of batteries, outperforming in all areas, but they are also expensive. Heat is the biggest risk to Li-Ion batteries. Because they do not suffer from memory effect, Li-Ion batteries do not wear out over time because of charging issues. Instead, Li-Ion batteries wear out because of age and use. Regular age and use wear down the internal components of Li-Ion batteries and reverse their electro-chemical processes. Heat, at any time during use or charging, is the major cause of accelerated deterioration in Li-Ion batteries. Even with their relatively short life cycles, Li-Ion remain a better choice because of they charge fast and have a high capacity. Also, because the technology is still pretty new, Li-Ion batteries are still seeing many improvements that overcome their minor disadvantages. Li-Ion batteries are the most light-weight of the three kinds of rechargeable batteries. Li-Ion batteries benefit from high energy density like NiMH batteries do. They are much less sensitive to damage from temperature changes than NiMH batteries. Li-Ions are not restricted in the shape of their design like NiCd and NiMH batteries are, and can be designed in almost any shape for better tool balance. They do not suffer from self-discharge and memory effect like NiCd and NiMH batteries, meaning that they're much less sensitive to recharging and storage methods. They have the longest charge/recharge life cycle of all three types of batteries. Li-Ion batteries are not destructive to the environment. Excessive overheating of Li-Ion batteries can damage or destroy them, which can occasionally happen during recharge. However, most rechargers and Li-Ion batteries are designed with safety features to prevent overheating. They have the shortest overall life cycle of about 300-500 charges. Li-Ion batteries are the most expensive batteries of these three types. The effects of these shapes on actual battery performance is nominal, but battery shapes can affect user preference by the way that they contribute to the overall balance of the tool. Li-Ion batteries are especially liked by users, because the way they are made does not restrict them to blocky shapes, and they can be contoured to provide better tool balance. 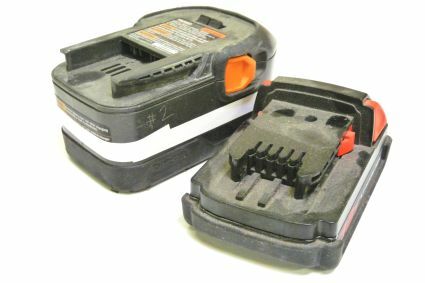 Cordless tool battery chargers should also be selected very carefully, because the quality of the charger can greatly determine how long the batteries will last. Slow- These take 14-16 hours to charge nickle based batteries, and will be less expensive than other chargers. Quick- Charge time of 3-6 hours. It is important to have a quality unit for faster chargers, or they will not switch over to a slower "trickle charge" when the battery is almost full. This is important, because overcharging is one of the major causes of memory effect with nickle based batteries. Fast- Fast chargers can charge nickle based batteries in about an hour. Fast charging is best for NiCd and NiMH batteries, because it reduces memory effect. Selecting a good unit that switches to "trickle charge" at the right time is also important for fast chargers. Buy the fastest charging charger you can afford. Buy a unit with sensors and electronics that optimize your battery type's charging needs. NiMH chargers can charge NiCd batteries, but not the other way around. Li-Ion batteries can only be charged safely one way, at about a 3 hour charge time. Li-Ion charger units that suggest faster charging and decreased capacity loss should be approached with skepticism. Usually, these units only charge the battery to about 70% capacity and damage its long-term performance. Buy the most expensive charger you can afford. Focus on heat reducing features. [Back to top] Conclusion If you're here to replace your cordless tool's battery, then shopping is just a matter of finding a match to the battery you already have. 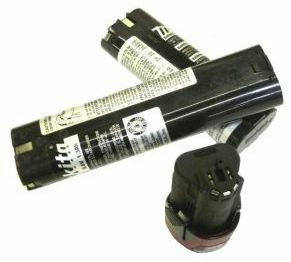 Visit our Batteries page here at eReplacementParts.com, another power tool accessories service available through our online warehouse and shipping service. Shoppers on our website can find the exact battery they're looking for fast, thanks to our search narrowing features. Just click on your tool's manufacturer, voltage, or battery shape to view all matching batteries. Also, take a look at our Battery Chargers page. Not getting the life or performance that you expected from your cordless tool batteries? It might be time to use this article's information to find a charger that fits the needs of your battery. eReplacementParts.com is proud to offer these information resources and streamlined search options that help our customers save money and put their tools back to work.